It's finally time for the round-up of the third round of the flavour pairing event They Go Really Well Together (Originally created by Martin from Khymos.org) that was all about pairing strawberry and coriander. Or should I say already? It seems like I've been writing the round up for the whole night now. I'm kind of busy over here as I'm leaving for a training camp tomorrow morning (or should I say today?) and I haven't even finished packing! Luckily my mood couldn't be better than it is right now. Today was the most important day for all Estonians - the day of our song festival. Imagine over 26000 young people singing together as one, singing to their nation! It did get me crying there on the stage, seeing all the people standing up, holding hands. This round brought together 14 participants. More than one half of them were skeptical at first, but chemistry has sure done it's job here! Although several had their unlucky attempts (including me! 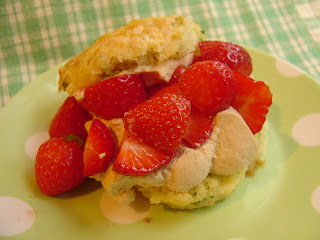 ), they tried again and succeeded in creating a dish which made strawberry and coriander go really well together. Well, almost, it's a matter of taste anyway. But there was noone to claim that the combination had been inedible. I'm really proud of all the participants, you've done a whole lot of work and what you've created is really interesting! It's been a pleasure reading all this, it's been a pleasure even in the middle of the night. Johanna from Melbourne at Green Gourmet Giraffe got inspiration from her shampoo and conditioner bottles to prepare Berry Guacamole. Although eating coriander was quite a challenge for her, she decided to try it. Again. 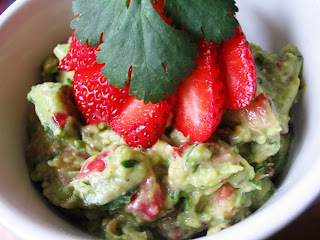 Johanna substituted the usual tomato bits in her guacamole with strawberries and added fresh coriander. She suggests eating it with a simple toast with sauerkraut. Is there someone out there who wouldn't want to try this out (except for my parents, of course) ? 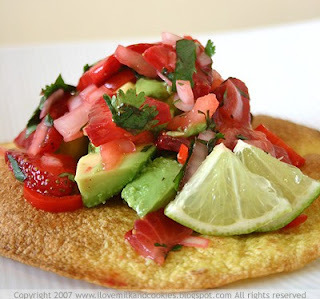 Johannas verdict:The guacamole was great – the sweet succulence of the strawberries contrast nicely with the creaminess of the avocado and the coriander adds an interesting flavour – but still seems a little soapy! Martin of Khymos.org made foamy strawberries with coriander. He added balsamico vinegar because it emphasizes the strawberry aroma and adds acid which he finds important. He warmed the foam up, well, because he could... I wish I had a whipper like he has! Martin suggests that the reason why many people don't like the taste of coriander might just be because they've used too much of it in a dish. 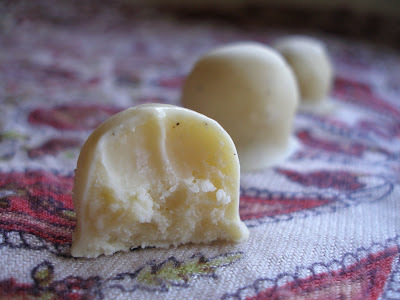 He advises to try it first in small amounts because the taste will come through well. Martin's verdict:I was very satisfied and my wife liked it too! There’s a good balance between the strawberry and coriander aroma. Sugar rounds of the taste and the balsamic vinegar balances the sugar with it’s tangyness. Helene from Germany at Neues aus der Küche (New from the kitchen) made a Strawberry and cilantro terrine. 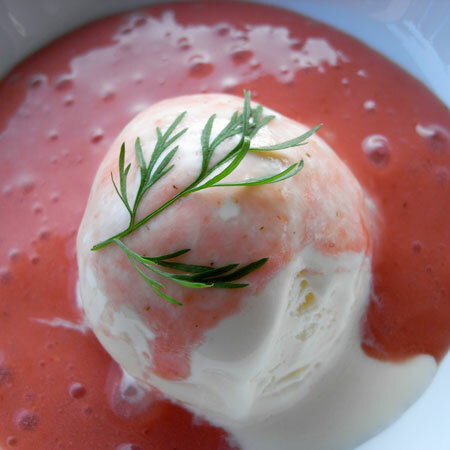 After being disappointed at the combination of strawberry, cilantro and asparagus where cilantro appeared to be really soapy, he decided to just go for adding yoghurt and made a terrine using agar agar. Simple and wonderful, isn't it? Helene's verdict: It went well, also the yoghurt flattened the dish. My family and I would vote for a simply strawberry salad with cilantro and perhaps a tiny bit of balsamico. Amrite from Singapore at Le Petite Boulanger made a strawberry salsa. Although she never would have thought the combination to work well, she gave it a try and liked it. A mixture of strawberries, corinader leaves, tomatoes, jalopeno peppers and onions was left to mingle overnight and was served on a bruschetta. Yum. Amrite's verdict: The result was a fantastic salsa, which was surprisingly not sweet at all. It had a lovely savoury flavour to it, much like regular salsa, but the difference with this salsa was that it had a more delicate flavour. The coriander worked really well in it. Sprenger Robert from Basel in Switzerland at lamiacucina made Strawberries with Campari and coriander filling. His dessert uses coriander seeds, strawberries are filled with a smooth jelly. The original idea of strawberries with Campari filling is said to come from Ferran Adria himself, the chef of El Bulli. Don't you think it's really really really mouthwatering? Robert's verdict: The resulting strawberries are a very tasty pre-dessert. The corinader seeds fit very well with the bitter Cmpari and the strawberry. May be, that the bitterness of the Campari did mask the strong taste of the coriander a little bit. Try it! Klaus Dahlbeck from Germany at der Kompottsurfer prepared Roasted coriander ice parfait with marinated strawberries and green tea sauce. 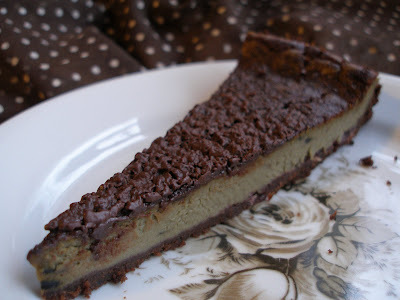 He extended the combination to a triple pairing by adding green tea. This is even more experimental! He discovered that green tea should also be 'chemically ment to be' with strawberry and coriander. Klaus's verdict: He was impressed by how well the flavours went together. 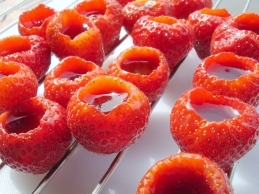 M from M's blog made Freeze filtered cold strawberry consomme. He roasted all the ingredients, including strawberries and simmered them for one hour. To achieve a cristal clear consomme, he used the freeze filtering technique introduced by Ideas in Food. I'm very impressed by how much work went into this soup. Brilliant! 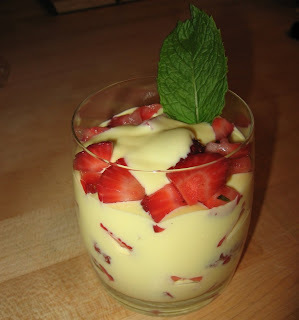 Alexis and Giao from San Francisco at See Us Eat prepared Coriander custard with fresh strawberries. They were worried that coriander might overpower the dish and decided to just infuse the custard with coriander seeds by heating them together with it. This fabulous dish definitely made me think of coriander creme brulee...with fresh strawberries of course! Alexis's and Giao's verdict: This method proved effective in that the custard was subtle in coriander flavor, yet also unmistakable. True to the name of this event, coriander and strawberries really do go really well together. Mari Gordon from the Netherlands at Mevrouw Cupcake made Strawberry Shortcakes with a Coriander Buttermilk Biscuit and Balsamic Cream. She, although pretty ambivalent on the subject of molecular gastronomy, prepared a wonderful dessert containing both the leaves and seeds of coriander. A good idea for those who just cannot decide! 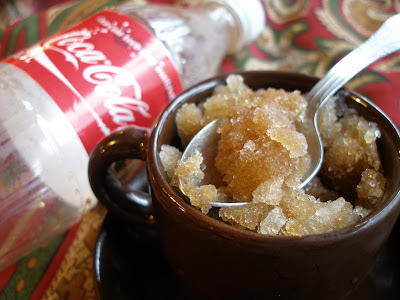 Mari's verdict: The result, however, was a curiously delicious adaptation of my favorite childhood dessert! The addition of coriander imparts the slightly sweetened biscuit with a savory fragrance. The dark balsamic syrup is pungent, spicy and sweet; but when added to the whipped cream, mellows, allowing the caramel and citrus flavor of the syrup to take center stage. Jen from Sydney at Milk and Cookies prepared Avocados with Strawberry Salsa on Crispy Tortillas. She just added coriander leaves to an existing strawberry salsa recipe. In fear, it's true, but she's more into molecular gastronomy now than she was before. Doesn't that prove something about the combination? Jen's verdict: I could taste the strawberries with little hints of coriander here and there and combining the nutty flavour of the avocado somehow neutralised the flavours. I would say that if you did want to try the combination of strawberry and coriander but you’re a bit of a chicken, then this is a recipe you will be able to stomach. 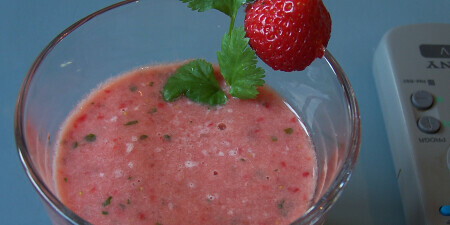 Dennis from the Netherlands at Kookjegek made Strawberry and coriander smoothie and a Strawberry and coriander dessert. As for the smoothie, he just mixed together strawberries, coriander, yoghurt, melon juice and some balsamico in a blender. Perfectly easy, isn't it? 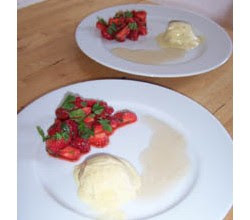 Balsamico was also used in his dessert for marinating strawberries that were later served with crème fraîche and coriander. Dennis's verdict: He also thinks that balsamico is a good addition to the combination, coriander gave both his smoothie and dessert a nice after-taste. 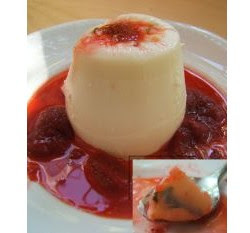 Paula Schramm aka Jokerine from hdreioplus.de made Cilantro panna cotta with strawberry sauce. She decided to go with the motto 'easy does it' and prepared panna cotta with a simple sauce, flavouring both of them with lemon. So nice that a woman in science has decided to join the event! 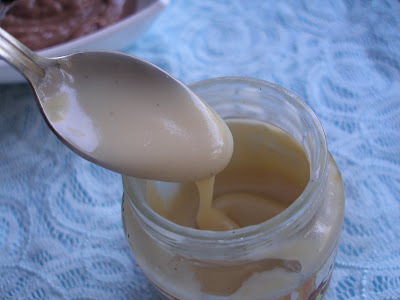 Paula's verdict: What I always liked about Panna Cotta was the soft creamy consistency. This is really brought out by the freshness of the lemon and cilantro. This recipe is definitely a keeper. Stephanie from the USA at Cupcake, my love made Deep-fried strawberries with chocolate dipping sauce. Now she is enthusiastic! For the strawberries, she made a deep-frying batter flavoured with cinnamon. But what is a strawberry without chocolate sauce? She ate her warm strawberries with a coriander-infused chocolate dipping sauce. 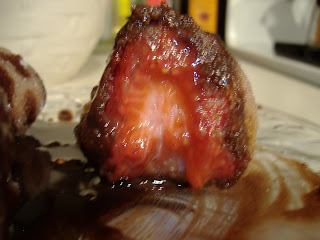 Stephanie's verdict: My Fried Strawberries with Coriander Chocolate Sauce will easily become a dessert that you will not be able to take your mind off of, so I apologize in advance :0) But you're gonna love it!!!!!! 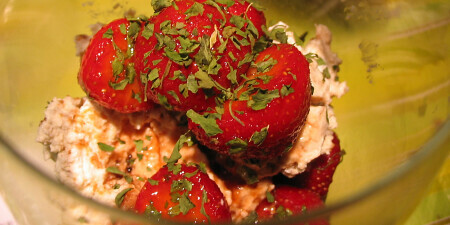 My contribution was Coriander and coconut syrup over sunny strawberries. I made a syrup using coriander leaves, strained it and mixed with coconut milk. We ate it mixed with fresh strawberries, we ate it with everything. My verdict: The flavours of strawberries and the syrup 'complete each other. It might be a matter of taste, but I was positively surprised. Coconut had been like a missing link in the combination for me. I believe the syrup is a keeper. On strawberries or on anything. 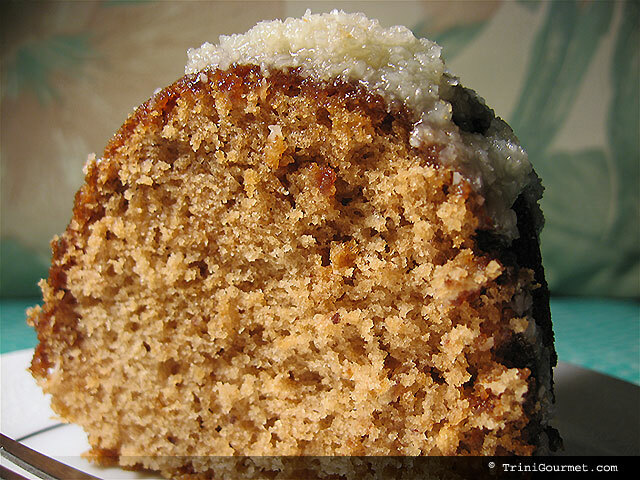 Sarina Nicole from Trinidad over at TriniGourmet made a strawberry-coriander cake with coconut glaze. This lovely cake contains strawberry jam and ground coriander seeds. Sarina was happy to try adding coriander instead of allspice, because its slightly citric quality would lend itself well to this kind of dessert . And it seems like it did! And well! Sarina's verdict: ...boy do I think this was the most successful pairing to date! 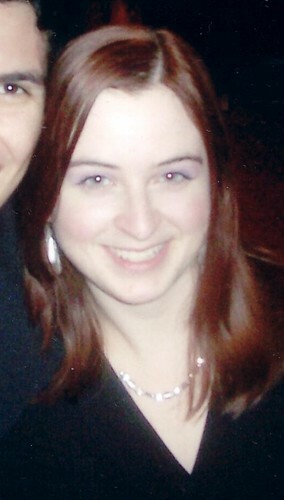 Tara, the wonderful host of TGRWT#2 from Australia at Should you eat that? prepared Strawberry and coriander crumble. Tara's verdict: The crushed seeds gave a lovely nutty flavour and aroma to the crumble and in all I think they added a different layer of flavour. It was delicious! Now keep your eyes open as the fourth round has already been announced! 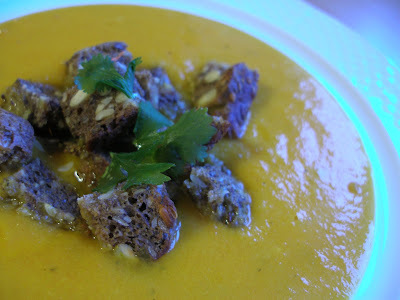 Dennis of kookjegek.nl asks us to pair mint and mustard. I'll definitely try to figure something out! Haven't read about the previous rounds? They're right here! 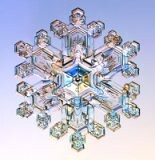 What a wonderful round-up, all the entries look delicious! Great job Evelin. Thanks for the round-up, all entries look great. Have to try that strawberry salsa! wow wow wow how wonderful and creative! now I need to make all of these.. I was grotesquely late to get my post up, so won't presume to ask you. But I did give you the link on my post (http://littlebouffe.blogspot.com/2007/06/they-go-really-well-together-3.html) and I'm very grateful for the challenge, loved it. Päris lahedaid ideid on siin! 4cnvIV The best blog you have!